Malik Riaz of Bahria Town signed a deal with Shaikh Nahyan bin Mubarak Al Nahyan (Chairman Abu Dhabi Group) in February 2013 for building world's tallest tower in Karachi, Pakistan. Bahria Town signed the agreement with Abu Dhabi Group, Union National Bank and United Bank Limited. This was Pakistan's biggest real estate investment worth 45bn US Dollars from which 35bn would be invested in Karachi while 10bn US dollars would be invested on projects in Lahore and Islamabad. This deal came to the end within a week by publishing a statement in newspapers. Read full article for details of this project. Abu-Dhabi Group has already made some huge investments in Pakistan e.g. Warid Telecom, Wateen Telecom and Bank Alfalah. Bahria Town has earned good name in real estate industry of Pakistan by developing Bahria Towns' Housing Schemes in big cities of Pakistan. Total investment amount is US$35bn. It is proposed to build world's tallest building, an international city, a sports city, a media city, an educational and medical city, and miniatures of the seven wonders of the world in Karachi. Building to be construct in Karachi will be taller than Burj Khalifa Dubai (currently world's tallest building). 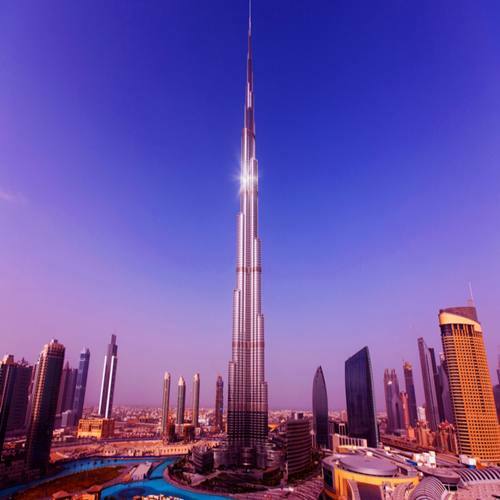 Height of Burj Khalifa is 828m and it has 163 floors. Although construction details or design specifications of "building in Karachi" are not currently available but it must be taller than 828m. This project will be completed in 3 to 4 years. Name and site of the biggest building is not revealed yet however accoding to some News sources, site for the construction of the project would be KPT Island which is also known as Kutta Island. According to Dawn News, a seperate building of 125,000 houses is also part of the project. Electricity will be produced from sea water. A mega advanced water treatment plant would also be built to purify salty water of sea to make it drinkable. Project in Karachi will have its own Grid Station. This ill be first entry of Pakistan in tallest buildings of the world. According to Wikipedia, there is no Pakistani building listed in top-300 tallest buildings of the world. It will also be largest Skyscraper of Pakistan. Direct investment of US$45bn will be made in Pakistan. It will also cause indirect investment in the country. This deal will generate 2.5 million new direct and indirect jobs in Pakistan. About 55 local industries e.g. cement, iron, steel, glass etc will prosper and grow. It will revolutionize tourism industry of Pakistan. This investment will create soft and peaceful image of Pakistan and ultimately attract other investors for investment in Pakistan. Malik Riaz Hussain of Bahria Town said in a newspaper statement that due to political interference Abu Dhabi Group has withdrawn itself from the deal but his committment to revival of Pakistan's economy remains unaffected. He said that other prominent investors form USA and Middle East are in contact with him for another mega project.